If I want to know the day, my eyes just have to jump to the last two digits of the string no matter what, and that's extremely efficient for me. It is also much easier to click roughly in the end of the GtkEntry to set the cursor in a way I can delete and rewrite the date easily (since I don't use the date picker popover widget, unless I don't know what date I'm looking for). 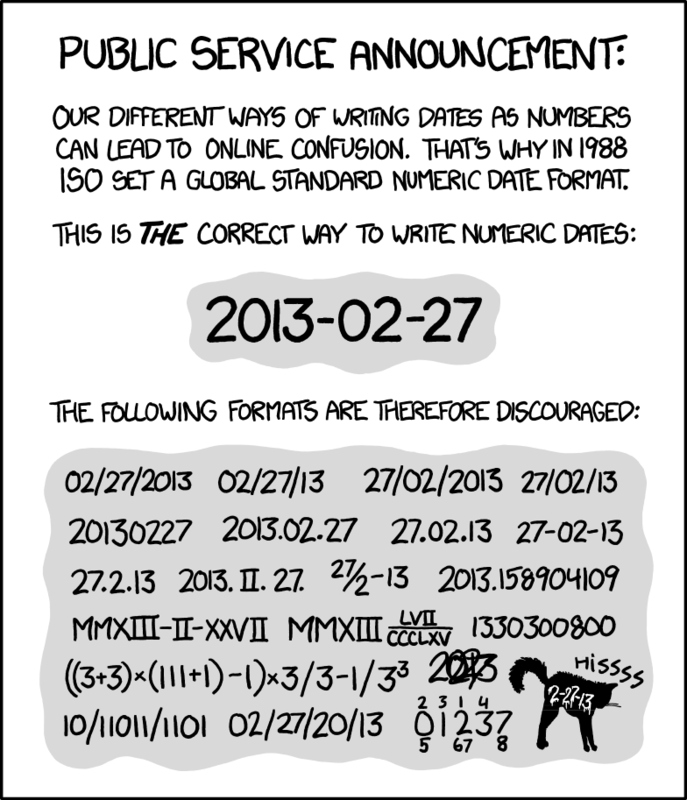 Semi related to #92 but separate issue nonetheless: My mind can't quickly parse anything other than the YYYY-MM-DD standard format, [ISO 8601](https://imgs.xkcd.com/comics/iso_8601_2x.png). I would really like to be able to use it in GNOME Calendar no matter what the system locale is. With other date formats, I can never easily tell which part is the month and which part is the day (especially as I keep alternating between English and French systems), and my eyes have to parse the whole thing evertime... whereas with ISO 8601: * There is no confusion * If I want to know the day, my eyes just have to jump to the last two digits of the string no matter what, and that's extremely efficient for me. * It is also much easier to click roughly in the end of the GtkEntry to set the cursor in a way I can delete and rewrite the date easily (since I don't use the date picker popover widget, unless I don't know what date I'm looking for).